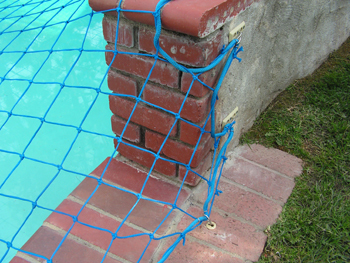 Pool Guard Pool Net are a safe and beautiful way to secure your swimming pool. Nets can bring numerous benefits to your family and your back yard, providing safety to your family and preserving your deck space and view. 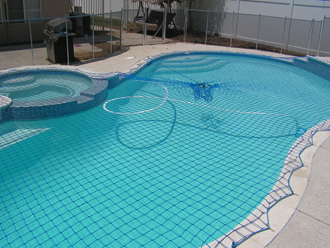 Pool Guard netting is placed over the pool in about five to ten minutes and can be removed in less time than it takes to place back on. California has numerous applications for netting due to the size or location of California back yards. If you are in a small lot in Orange County or have a view of the Coachella valley the net can work for you. The people that need nets are first and foremost people that need safety for their children but they are also people with other needs. Is your back yard all swimming pool? A net takes up less space. Don’t want a pool fence to crowed the yard, or cut the yard in half. Have a view and feel that a fence will blemish the look? Here again is another place where the pool net can work wonders. What is a Pool Net? 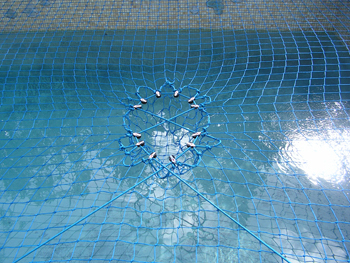 The Pool Safety Net is laid across the top of the pool and then pulled tight by a pulley system called a CTS (Central Tension System).Nets are made of a durable high density polyethylene braid that has proven through test will comply with the 485lb. required by most states and meeting California’s ASTM 1346 standards. The net has maximum U.V. stabilized inhibitors so as to not allow shrinkage or fade in harsh environments. The mesh size will prevent a toddlers head from penetration, but also large enough so children can not easily move about. Most are very hesitant to step on a net and see it as barrier it is. How does it connect to the deck? Small anchors are drilled and secured into the pool decking every two feet around the pool. These Special Pool Guard anchors are unique to the pool safety industry, California Pool Guard gives you the option to use two options of deck anchors as well as several wall mount anchors. 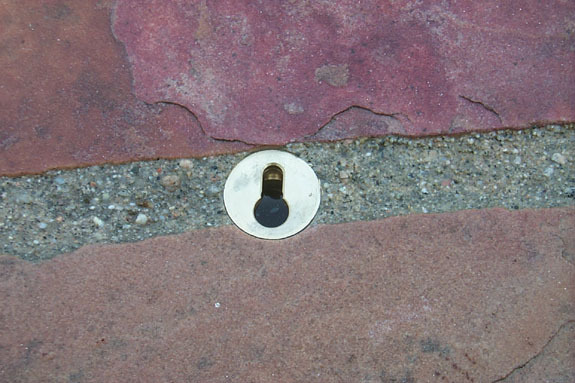 We offer a polyurethane composite anchors in red and sand that not only holds a firm grip in the concrete but has a concrete color to it, allowing it to blend into the color of most decking. We also offer a Brass anchor that has a more permit classic look that can complement the look of your pool. 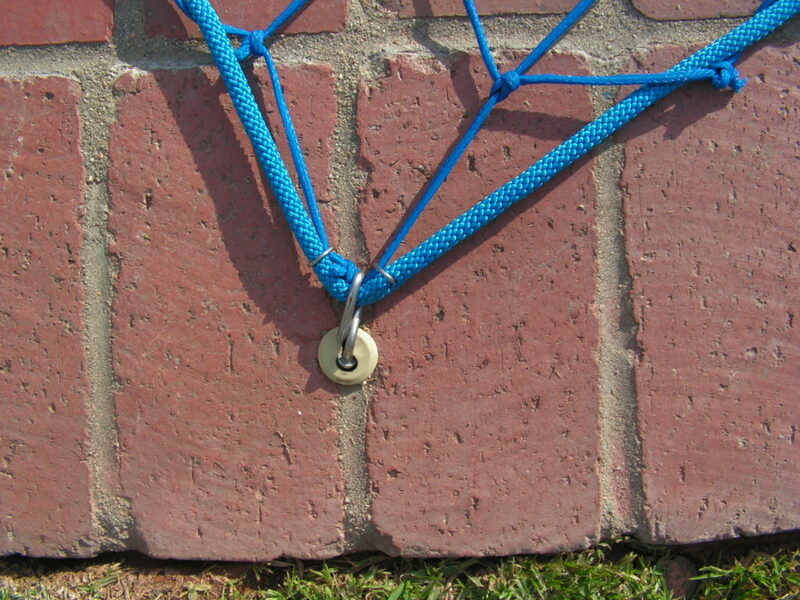 No matter which anchor you choose, both are safely gripping the concrete providing a secure pool safe net. Keep in mind that the pool net is a barrier that can’t be climbed. Children and toddlers can’t find a way through. A net is a sure thing. Net barriers also can support a huge amount of weight. Up to 500 pounds. So have no worries about having a child crawl out onto the net. It won’t break. Net are also affordable, sometimes costing less than a fence by a thousand or more dollars. Finally, Pool Nets are not for everybody. It takes the home owner or parent to be part of the process. Parents need to make sure the net goes on right back on after swimming or cleaning the pool is complete. It only takes a second for a child to slip out the back door or maybe a pet door, so the net needs to be on the swimming pool. If you think that you might be that customer that just doesn’t have time to put the need on at the end of the day, then the right product for you, is a Pool Guard Mesh Removable Fence. Are made of 4mm thick polyethylene with maximum UV stabilized inhibitors to resist fading, deterioration, and shrinkage. Use Marine grade stainless steel clips to hold the net to its respective anchors. Stronger thicker Perimeter Rope than most of our California competitors. Come with a series of pulleys and ratchets that make them easy for the average adult to remove and reinstall. We also offer an optional PVC net roller for safe storage when not in use. 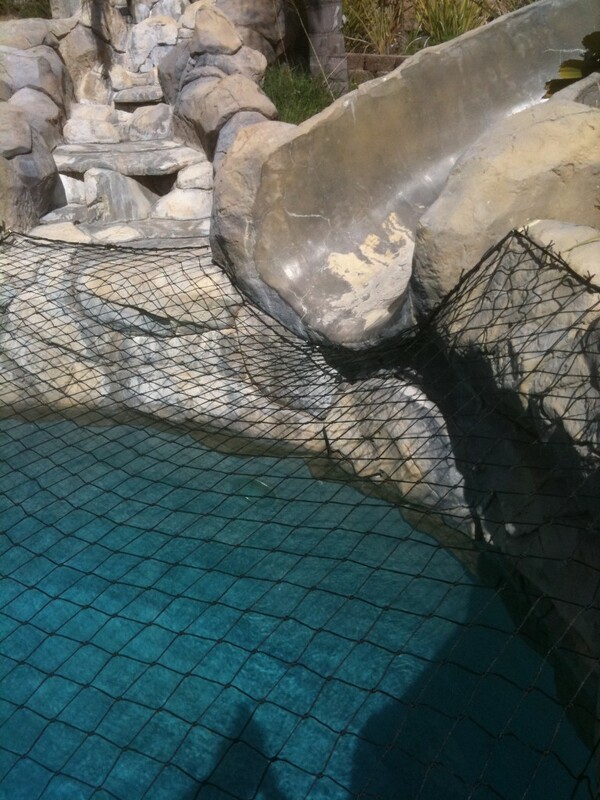 Check out our Los Angeles Pool Guard Dealer Demonstrated the ON/Off process of our Pool Safety Net. Call 909 800 6412 for your local Pool Guard dealer.